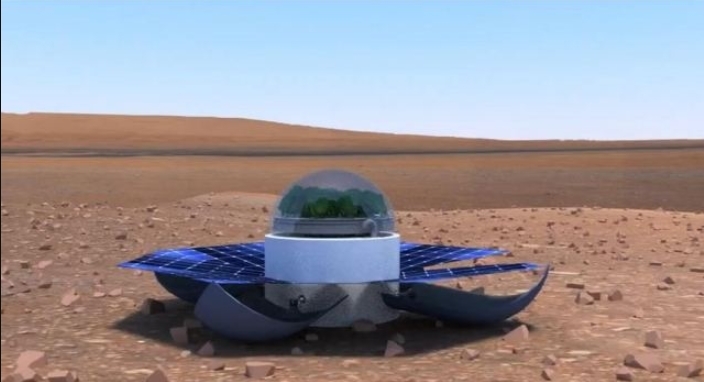 There is also an artists conception of a tiny greenhouse module sitting on the surface of Mars, with a small plastic dome and a circular array of solar panels unfolded around its base. I'm just curious about the history of this 2013 design. How might it get there, sitting upright, and how it might work in terms of providing a suitable environment for the spinach to grow, and, perhaps, how people on Earth might receive information that it did grow. Plants, including both trees and spinach, are made substantially of water an cellulose (along with many other carbon-containing compounds), and so there must have been an internal source to supply say at least a hundred grams of CO2 in order for the plant to grow. I suppose it could just deplete it's own high CO2 atmosphere, but there may have been a tiny CO2 regulator and makeup system. Ditto for water. Small objects have high surface/mass ratio, and so can cool quickly and precipitously overnight. Was that addressed in any way by this design? A good answer will track down material on this 2013 design and explain whatever thinking did go into it's design issues and operation as an exercise. I'm not necessarily interested in a technical feasibility review. With the landing of the Mars Rover, many feel we’re closer than ever to establishing the first Mars colony – but there’s still the question of how to sustain humans on a dead planet. Fortunately, a group of Greek students have come up with a deployable greenhouse that could feed Mars settlers (assuming we could get them there in the first place). The project (called “Popeye on Mars“) has been named a winner in the NASA International Space Apps Challenge, a competition that seeks to engage thousands of people around the world in space exploration. Capable of producing fresh spinach in just 45 days, the dome-shaped aeroponic growing system could be used for pre-deployment on a space mission to the Moon or Mars. Not the answer you're looking for? Browse other questions tagged lander space-art or ask your own question. What factors are considered when choosing a Mars lander landing site? How does a lander get from orbit to the ground? Artificial Shooting Stars - how could this possibly work (economically/technologically)? 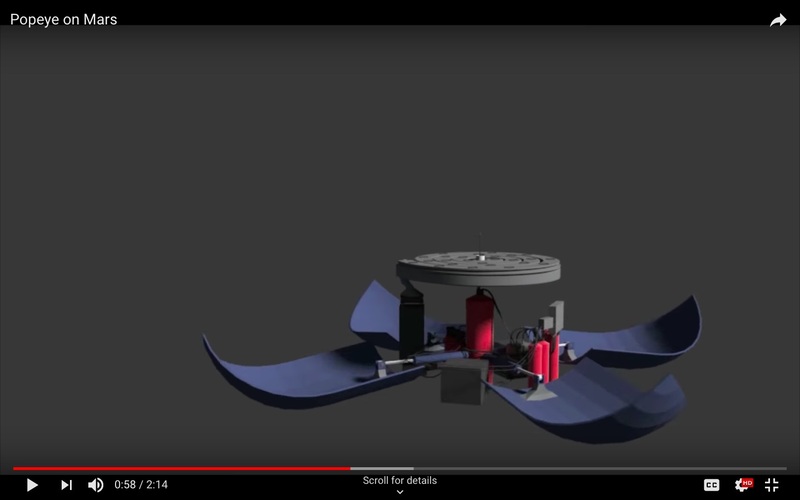 Why a donut-shaped balloon decelerator in the Aldrin-Purdue proposed Mars lander descent? Why does this rocket have a nose cone “cozy”? What might this “NS” mean in this speculation about this Mars rover's future prospects?